One woman's journey to understand the world and her place in it. I did it! I ran 21km and completed The Great Wall (half) Marathon! With seven kilometres of stairs there was a lot of walking as well. Particularly one steep section that was more rocks cemented together than actual stairs. I feel so gratified by this achievement, the result of more than just one days hard work. I have been training for months. Building up from struggling to run more than 10 minutes to being able to finish a half marathon. How did I do this? I had help from a couple of apps, Zen Labs Fitness C25K and 13.1 and Headspace, the support of family and friends, and finding my mental strength (see my previous post on finding my strength). I have to admit that this strength left me for a big part of the race. All that was going through my mind was “#*@! what the #*@! was I thinking? I’m a #*@! idiot for thinking this was a #*@! good idea.” (#*@! – insert expletives here.) However, I remembered the advice from Headspace’s meditation and pushed these thoughts out and instead focused on a time when I had been training and enjoyed running. It worked! Suddenly I felt free, it became easier to run. Similarly not feeling I had to run the whole time really helped. Drawing from my training with the 13.1 app I knew it would be more achievable if I allowed myself one minute walking then running for as long as I could. So, what was it like? I compare it to childbirth. People tell you how hard it is but until you experience it for yourself, you don’t really understand what it is like. The worst bit – the stairs, of course. Climbing a million stairs to reach the top and see you have a billion more to go really messes with your mind. The best bit – the amazing views from the top of the stairs. When you have to stop to catch your breath it really helps to be able to look at the stunning scenery. And running through the villages with the locals cheering you on. The funniest bit – having to stop running to allow a farmer to herd his flock of sheep across your path. When I finished the race I was relieved it was over. As I crossed the finish line I vowed never to do it again. However by the morning I was texting my family telling them that we were ALL going to do it next year, my 9 year old son included. Inspired by two of my friends who completed the marathon (one was the first female to finish, the other completing her first marathon just 20 minutes before the eight hour cut off time), I am seriously contemplating setting my sights on the full marathon. All 42.1 km of it, including tackling the 7 km of stairs twice! One of his last acts was to take a picture of himself, standing near the bus under the high Alaskan sky, one hand holding his final note toward the camera lens, the other raised in a brave beatific farewell. His face is horribly emaciated, almost skeletal. But if he pitied himself in those last difficult hours – because he was so young, because he was alone, because his body had betrayed him and his will had let him down – it’s not apparent from the photograph. He is smiling in the picture, an there is no mistaking the look in his eyes: Chris McCandless was at peace, serene as a monk gone to God. Having recently read and reviewed books about solo journeys into the wilderness, I thought I would explore a similar story that did not end so well. Into the Wild tells the story of Chris McCandless who disappeared into the Alaskan wilderness, four months later his emaciated body was found by hunters. The author, Jon Krakauer, pieces together the years leading to Chris’s death and explores why Chris and many people like him feel compelled to leave civilization behind and to push themselves to extremes. Understanding Chris’ motivations is much more difficult as he never clearly articulated them (and obviously he’s not around to ask). Jon delves into his reasons by speaking with family, friends, and people Chris met on the two year journey leading to his final trip to Alaska. To gain an insight into Chris’ mind Jon explores the experiences and stories of other adventurers, himself included. He explains why people feel compelled to push themselves to the outer limits and how even the best prepared can find themselves in danger. It is easy, when you are young, to believe that what you desire is no less than what you deserve, to assume that if you want something badly enough, it is your God-given right to have it. When I decided to go to Alaska that April, like Chris McCandless, I was a raw youth who mistook passion for insight and acted according to an obscure, gap-ridden logic. I thought climbing the Devils Thumb would fix all that was wrong with my life. In the end, of course, it changed almost nothing. But I came to appreciate that mountains make poor receptacles for dreams. And I lived to tell my tale. These people journey into the wild alone because they are adventurers, physical extremists, escapees from society, romantics. They all have similarities, they are all different. They all have their reasons, sometimes knows to themselves and others, sometimes, I suspect, they don’t even know themselves. Notably many are male, often young but not always. We know women do this too, Cheryl Strayed and Robyn Davidson for example, but they are in the minority. What did I take from this book? Adventuring alone in the wilderness is not romantic, things can and do go wrong. Solo journeys don’t always solve the issues you want them to. And tell someone where you are going! I found Into the Wild an interesting read. Not just learning about Chris McCandless’ journey but also the authors, as he recognizes and accepts his own failings as an adventurer and as a writer. “HAPPINESS IS ONLY REAL WHEN SHARED.” It is tempting to regard this latter notation as further evidence that McCandless’s long, lonely sabbatical had changed him in some significant way. It can be interpreted to mean that he was ready, perhaps, to shed a little of the armor he wore around his heart, that upon returning to civilization, he intended to abandon the life of a solitary vagabond, stop running so hard from intimacy, and become a member of the human community. But we will never know, because Doctor Zhivago was the last book Chris McCandless would ever read. Most people would expect the usual practice is to review books I have read. This time I thought I’d write about a few books I haven’t read. Or to be more specific, books I’ve started reading and just haven’t been able to finish. Being an avid reader I am quite proud of the range of books I have read. I really enjoy reading and have at times read some very unusual genres (for me); biographies of footballers (I am NOT a football fan of any code), farming manuals (thanks Dad), and Mills and Boon romances. I usually don’t give up on a book. I believe that every book has some merit and will do what I can to find it. I once decided to read Leo Tolstoy’s War and Peace. I really struggled at the start and almost gave up, then I realised that I found the War parts boring. I decided to simply skip the battles and ended up quite enjoying the book. At the start of this sabbatical I was searching for inspiration for my own blog and started reading a few different book review blogs. In the introduction of one such blog, Life of Chaz, Chaz said that he rates the books he reviews highly because he only reviews books he finishes and he doesn’t finish books that he doesn’t like. We all do not have the time left in our lives to finish our “To Read” pile. This was a new concept for me but one that I have embraced during my sabbatical. There are so many options, things to do in the world. Why waste my time doing something I don’t enjoy? So, what books haven’t I read? Zen and the Art of Motorcycle Maintenance by Robert M Pirsig. It was the title that piqued my interest. It reminded me of A Short History of Tractors in Ukrainian by Marina Lewycka, a book I quite enjoyed. A quick read of the blurb on the back hooked me in. … and unforgettable narration of a summer motorcycle trip across America’s Northwest, undertaken by a father and his young son. A story of love and fear – of growth, discovery and acceptance …. I’ve read seven chapters (about one quarter of the book) and haven’t picked it up since. Five months ago! Some parts are quite good but then the author goes off on a tangent, I’m sure to illustrate a point he is making or to prepare us for the next part. Anyway he went off on a tangent and I put down Zen and the Art of Motorcycle Maintenance. Another book is The World’s Religions by Huston Smith. One of the goals of my sabbatical is to explore spirituality and gain a better understanding of what is out there. To this end I thought I’d learn about the different religions. This book was recommended by a few people online and the clincher was discovering that the author was born almost 100 years ago in the city where I now live! I started reading with great enthusiasm. I quickly read the chapter on Hinduism. I worked my way through Buddhism. I then started reading about Confucianism, a religion I was quite interested to learn more about given I am living in China. I struggled. Honestly, it really felt like I was reading a text book and had to finish it because I was studying comparative religion at university. I reflected on this feeling and my new mantra, “Why waste my time doing something I don’t enjoy?” I haven’t read any more. To be fair, this book is used as a text book at university and maybe it is pitched at a level way beyond my ability. The Finkler Question by Howard Jacobson. OK, I honestly chose this book because the author and I have the same surname. I started reading, I got to the fourth chapter. I really wasn’t connecting with the characters. Life is too short and there are too many books to read to waste my time reading one I’m not connecting with. I started reading something else. Today’s life lesson is to do what you enjoy doing, to value your time and make choices that reflect this goal, even when it comes to reading books! Finally, I’d love to hear from anyone who has read, finished and enjoyed these books. What did you discover that I didn’t? There’s a sense of incompleteness in our lives…. it’s a feeling that something is wrong with us, that something is missing, or that we’re missing out on something in the world. Since the start of my sabbatical I have been following Leo Babauta’s Zen Habits blog. A recent post of his, The Craving for Wholeness That Drives Our Actions, got me thinking about my purpose and what it was that I was seeking. These past few months (nine, actually) I have been purposefully contemplating what matters most to me and how it dictates the direction of my time, energy and passion. Reading Leo’s thoughts on our sense of incompleteness and our craving to find a feeling of connection and intimacy with others to fill that void, I reflected on how I had been going about this. We wake up and immediately begin distracting ourselves, seeking something interesting, exciting, any kind of dopamine hit. We look for the convenient over the difficult, the quick and easy over struggle and meaning. We don’t give ourselves a moment of space or quiet, filling every bit of space with videos, songs, podcasts, audio-books, short online reads, news, social media, quick tasks, messages. I admit that I have structured my sabbatical with a carefully thought out action plan. I have goals. I have strategies. I even have a monthly timeline of tasks to achieve. But I have not considered that I need time to simply just be… To do as Leo suggests and stop for a while and allow myself to feel the discomfort and uncertainty of who I am. The wholeness of being completely OK, no matter where we are, no matter what we’re doing. Of being absolutely in love with our experience, of not needing anything more. Leo suggests some simple ideas on how we can find this sense of wholeness. I highly recommend reading Leo’s post and while you’re there check out the rest of his site. It makes for some inspirational and thought-provoking reading. Wild by Cheryl Strayed and Tracks by Robyn Davidson on the face of it are two quite similar books. The story of a woman leaving her old life behind to travel alone in the wilderness. However, both are also quite different which is what makes them such good reads. Wild: A Journey from Lost to Found tells the story of Cheryl Strayed hiking 1,100 miles alone along the Pacific Crest Trail from the Mojave Desert through California, Oregon and into Washington state. Tracks is the story of Robyn Davidson’s journey across 1,700 miles of Australian desert with four camels and a dog. Probably not the most rational thing to do, but I think you have to be a little bit crazy to actually go out on your own and do this. Both had similar reasons for their journeys. Cheryl was quite forthright about her reasoning. For Robyn you need to read more deeply to get a sense of why she was compelled to do this. Interestingly Robyn’s mother had also died and, while she didn’t elaborate on her death, you got the sense that her mother’s passing had impacted her and her family as much as it had Cheryl’s. Unsurprisingly there were quite a few similarities in both stories. Both women were escaping society to find themselves, they encountered danger along the way, had periods of madness and times when they were perfectly happy in their aloneness. And both realized they couldn’t escape society forever. There were also differences. Much of this was due to the location of the journey, Australia and the US, and the women’s physical distance from civilization. And the timing. Cheryl’s journey took place in the 1990’s, Robyn’s in the 1970’s. While only 20 years apart much had changed in society. Technology and the perception of women in the community both made a difference to their stories. As an Australian, I found Robyn’s interest in and connection with indigenous Australians fascinating. There was very little in Wild about native Americans. Robyn was much more prepared for her journey having spent a significant amount of time in Alice Springs, mainly learning about camels and how to handle them. Given the isolation of where she was going and how she was traveling this was unsurprisingly essential to her survival. Cheryl had just her backpack. Robyn had four camels, and the support of National Geographic and a photographer visiting her a number of times on the way. I enjoyed reading both books, in fact I have read them twice in the past 12 months and watched the movie version of Wild (and would like to see Tracks too). In the long run, we shape our lives and we shape ourselves. The process never ends until we die. And the choices we make are ultimately our own responsibility. To continue my journey on reading books by women about their life and what they have learned from their experiences, I was recommended “You Learn by Living: Eleven Keys for a more Fulfilling Life” by Eleanor Roosevelt. For those who don’t know Eleanor Roosevelt was the wife of Franklin Delano Roosevelt, the US President from 1933 until his death in 1945. Eleanor significantly redefined the role of First Lady by actively involving herself in the public sphere. Following her husband’s death she remained active in politics and served as the first Chair of the UN Commission on Human Rights. Eleanor was widely respected but was also often controversial for her outspokenness. She even occasionally publicly disagreed with her husband’s policies! The biggest difference with the other books I have read recently was that this was written in 1960 – almost 60 years ago. While there are obvious differences in perspectives, much of what Eleanor writes about really does stand the test of time and remains true today. Throughout the book, many instances reveal that the writing is very much a product of its time. Despite stepping beyond the role of a traditional housewife and becoming one of the few women actively involved in politics at the time, there is a sense in the book that Eleanor believes that a woman’s first role is to support her husband and children. It has always seemed important to me that women should try to develop some interests in which their whole family can share. This is valuable all around. It intensifies family solidarity. And when she discusses how a person can be involved in public life she always uses the male pronoun. She does however recognise that women are increasingly entering politics and gives a few words of advice. The references to Communist Russia and Eleanor’s concerns about their way of life are also an interesting read. In one chapter she encourages the reader to be an individual. “Its your life – but only if you make it so.” She then refers to conformity and Soviet training where from two months old babies go to an institute while their mother is at work. It is in this institute that the Russian child is trained to follow routines and punished if they do not. However, much of Eleanor’s advice is as relevant today as it was in 1960. Some of the issues she discusses are so pertinent to the experiences of today that is it both frightening and amusing at the same time. Here, perhaps, lies the key to our [the United States] growing failure to win friends abroad, though we have, in every other respect, richly earned that friendship, in money, material support, and human kindness that asks no return. We have failed only in enlightened understanding and tolerance – and respect. Sometimes, of course, the citizen discovers that he cannot rely on getting information from this source, even in matters that vitally concern his future and his welfare. Eleanor divides the book into eleven chapters, with each chapter a piece of advice on how to Learn by Living followed by examples of what she has learned in her life. I could relate to such much of her great pieces of advice that my Kindle version of the book is full of yellow highlights. Courage is more exhilarating than fear and in the long run it is easier. Each of us has …. all the time there is. Those years, weeks, hours, are sands in the glass running swiftly away. To let them drift through our fingers is tragic waste. To use them to the hilt, making them count for something, is the beginning of wisdom. Every age, someone has said, is an undiscovered country. We are constantly advancing, like explorers, into the unknown, which makes life an adventure all the way. We are the sum total of the choices we have made. And, learn how to learn and continue learning throughout your life. If you can develop this ability to see what you look at, to understand its meaning, to readjust your knowledge to this new information, you can continue to learn and to grow as long as you live and you’ll have a wonderful time doing it. I have been consciously focusing on habits recently. Creating new habits and moving some on. We all have them, some good, some bad, some we are very aware of and some we don’t even realise. Recently I became aware of one habit I had never noticed before. The Sunday evening blues. Those of you who go to school or work Monday to Friday might know the feeling. You’ve had two days off. And sometime around 5 or 6 pm on Sunday evening the thought creeps into your head. Ergh! Work tomorrow. Bam! The Sunday evening blues have arrived. I don’t know when they started, probably some time during my school years. Ergh! School tomorrow. But then I remembered. I don’t have work to go to tomorrow. I’m on sabbatical. In fact, Monday is a day to celebrate. The rest of the people in my household are at school or work. I have time to myself. To write. To read. This is good. I took some time to reflect on this… How often have I got myself into the spiral of negative thoughts by succumbing to the Sunday evening blues? How does this impact my attitude at work? My approach to life? How bad is this habit, that I wasn’t even aware of? This makes biting my nails pale in comparison. This is one habit that was easy to kick and I will intentionally not pick it up again when I return to work. I have been following Leo Babauta’s Zen Habits blog. He has some thought provoking ideas on how to make changes in your life. He suggests making one tiny change at a time. How often have we woken up on January 1 and said OK I’m going to get fit this year? I’m going to lose weight and eat healthy. We go for a run, throw out the chocolate and wine and buy a shopping trolley full of fruit and veg. This lasts a week, a month or so. Then life gets in the way. You have to stay late at work a few nights. You have a big weekend of partying. The weather gets cold. And suddenly you have stopped running, and the cupboard is full of chocolate and wine. And you give up for another year. Leo’s advice is to start with one small achievable action. Aim to walk twice a week, have wine free weekdays. Just one thing. It will be more achievable. And once you have successfully kicked one habit you are more likely to be successful the next time. After all, habits such as the Sunday evening blues have likely been with you for a long time. The point of this whole Year of Yes project is to say yes to things that scare me, that challenge me. So in order to YES a problem, I have to find whatever it is inside the problem that challenges me or scares me or makes me just freak out – then I have to say yes to that thing. Of all the books I have read in my year of exploration I have connected with Year of Yes: How to Dance It Out, Stand in the Sun and Be Your Own Person by Shonda Rhimes the most. Oh my God! We could be twins. Shonda and I are the same age. Our birthdays are one day apart. We had the same love (obsession) with reading as we grew up. We’re from big families (five siblings). We both love writing. We both have somewhat unhealthy relationships with food. And almost everything she said in her book I could relate to. Yes! Yes! YES! That is soooo me! Can you see the family resemblance? Then she realized that to her shame, despite her envious job writing Grey’s Anatomy, Scandal and Private Practice, despite her three adorable children, despite her loving family and friends and to anyone looking from the outside her AWESOME, AMAZING life, she was, in fact, miserable. Shonda commits to a year of saying yes. Being interviewed by Jimmy Kimmel. This is it. It’s happening. And now that it is here, saying yes stops being just a vague idea. Now the reality of what I am embarking upon send my brain thundering around inside my skull. Yes to everything that takes me out of my comfort zone. Yes to everything that feels like it might be crazy. Yes to everything that feels out of character. Yes to everything that feels goofy. What follows is a genuinely life changing year (and more) for Shonda. I’m going to leave it to you to read the book and take from it what you will. I do, however, want to share a few quotes that had a huge impact on me. I think that a lot of people dream. And while they are busy dreaming, the really happy people, the really successful people, the really interesting, powerful, engaged people? Are busy doing. Don’t dream it. Do it. This is what my sabbatical year is about. 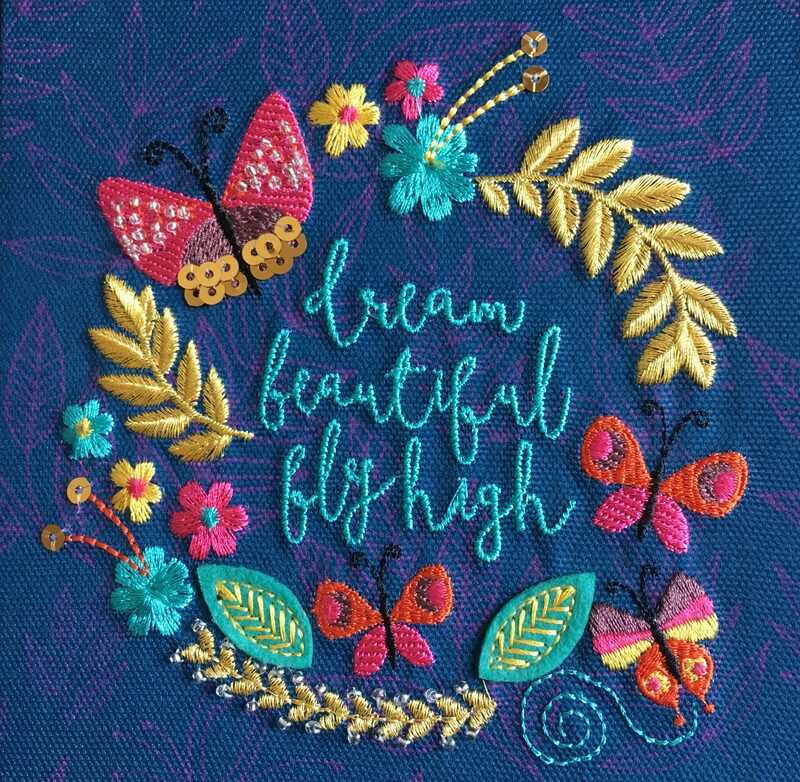 Not just to Dream Beautiful but to Fly High. Dreams are lovely. But they are just dreams. Fleeting, ephemeral. Pretty. But dreams do not come true just because you dream them. It’s hard work that makes things happen. It’s hard work that creates change. Being a mother isn’t a job. You can quit a job. I can’t quit being a mother. I’m a mother forever. Mothers are never off the clock, mothers are never on vacation. Being a mother redefines us, reinvents us, destroys and rebuilds us. Being a mother brings us face-to-face with ourselves as children, with our mothers as human beings, with our darkest fears of who we really are. Being a mother requires us to get it together or risk messing up another person forever. But only if you decide that YOU are going to do the work to make the programs work. Meaning, that nothing works if you don’t actually decide that you are really and truly ready to do it. This year I have set myself some big challenges …. learning Chinese, losing weight, running a half marathon, and more. All of these require commitment to make them work. Monthly, weekly, daily, hourly commitment. Six months in and I am doing well on some of the challenges I have set myself. Some not so well. And some have gone by the wayside (like writing in my journal every day). But that’s OK. These are commitments to myself. To make me a better person for me. And while I may not achieve everything I set out to do, I have (and I will) become me. The Year of Yes, I realize, has become a snowball rolling down a hill. Each yes rolls into the next and the snowball is growing and growing. Every yes changes something in me. Every yes is a bit transformative. Every yes sparks some new phase in evolution. I have been lucky to have some inspirational people come into my life just at a time when I needed them most. Their support and mentoring have helped me to become who I am today. When I was 21 years old, I was fresh out of university, living in a big city for the first time, and had just landed my first real job. My boss, Susan, opened my eyes to a life beyond my conservative rural Australian upbringing. She was the first women I knew who had a career other than teaching. She was married but hadn’t taken her husband’s surname and they had deliberately chosen not to have children. But she was caring and passionate, she was sensible and practical. Not at all like the “career women” I previously knew through stereotypes on 80’s television shows. Susan took an interest in developing me, she taught me the fundamentals of marketing and where there were gaps found the best professional development courses for me. She even became my de-facto big sister, making sure I was safe in the big city much to my parents relief. Later in my career I found myself in my first leadership position. Again I had a boss who was similar to my first – caring, passionate, practical – but now I needed to learn about leadership. Belinda had the amazing ability to listen to all sides with a open mind and see a pathway ahead. She showed me how to have courageous conversations with difficult people and encouraged me to solve issues myself. Her confidence in my knowledge and experience emboldened me to be confident in my own abilities, which in turn made me a better leader. People who inspire you go beyond simply teaching or mentoring. They go beyond the day to day. They have a deep impact on your whole life, professionally and personally. Have courage and stand up for what I believe in. Be authentic and comfortable with who I am. Be passionate and share that enthusiasm with others. Care about seeing others grow and improve. Challenge them to be their best. Lead by example. Walk the talk! Inspirational people come into your life when you most need them. (But perhaps not always when you are looking.) And sometimes it isn’t immediately obvious that they are there to inspire you. It is only afterwards, when you have had time to reflect, that you realize how much this person has had an impact on you. Thank you to those who have inspired me. This book has been on my reading list for some time. I was drawn to it again when I was searching for books related to my own journey: women seeking to understand their world, taking a break from the work treadmill to reflect on their purpose in life. Erin Callan Montella’s decision to take time off from work was not fully her own. She was the chief financial officer at Lehman Brothers in 2008 just before it spectacularly collapsed and played a part in kicking off the Global Financial Crisis. This memoir recounts her journey from a young girl to one of the highest ranking people on Wall Street and how her career became her life. Erin is an incredibly intelligent, brilliant and driven woman. Her ambition led her to take well thought out risks, to reach a position that no (few?) other women had achieved. While the cracks were already appearing before her resignation (sacking?) from Lehman Brothers it was this event and its aftermath that forced Erin to reflect on her life. While reading Full Circle I wondered what would have happened if this situation had not been forced upon Erin. Would she have had the self awareness to recognise and acknowledge the pathway she was on was not the meaningful purpose she was seeking? Needless to say she found her career in tatters, her emotional well-being reaching the darkest imaginable. She needed time to reflect and readjust to a new life and a new way of doing things. Erin only briefly writes about her new life as a wife and mother, which makes me wonder where this journey has taken her? What is she doing now (she mentions at the start of the book that she is retired) and more importantly what lessons has she taken into her new life? Did she find the balance that was so lacking in her old life? Or has she simply pursued the exact opposite pathway? While I am a long way from a high ranking career woman and never want to be, I still gained much from Erin’s memoir. To take time for self reflection. To consider what is meaningful to me. Many of her words inspire me as I reflect on my life, it’s purpose and what I am going to do next.